Gandia Blasco Tipi Wigwam Gigante covered outdoor tent. 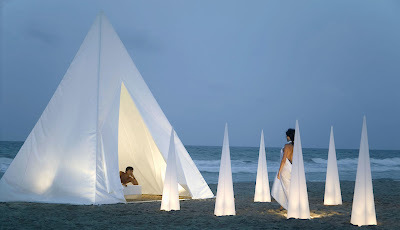 This covered outdoor teepee was designed by Jose Gandia for Gandia Blasco in Valencia, Spain. Gandia Blasco's Tipi presents a unique way to create a little oasis of your own. With a look that's more I.M. Pei pyramid than traditional tepee, Jose Gandia's Tipi is a streamlined modernist shelter from sun and wind. This covered outdoor teepee is perfect for the patio, garden, pool area, outdoor lounge or beach. Very nice and minimal, this beautiful outdoor teepee becomes a natural extension of the modern home. Its timeless good looks will compliment any outdoor space. The Gandia Blasco Tipi Gigante has a durable anodized aluminum frame. The anodized-aluminum frame, measuring 14.6 by 14.6 by 17.3 feet, is draped in white nautical yacht fabric. Secured by Velcro, flaps fold open to reveal a large space within. 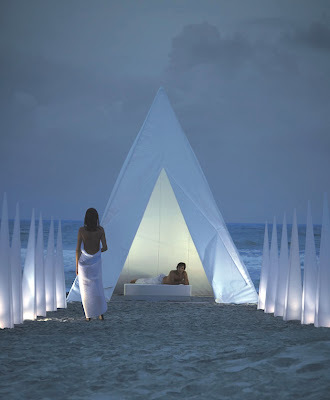 The teepee is covered with a white nautical yacht fabric shade (a blend of vinyl, polyester and jacquard) which provides shelter from the elements and some extra privacy. Tipi comes with 4 ground anchoring brackets which secure the structure to the ground. It is also available with four comfortable mattresses at an additional cost (each mattress is 82" x 82") which are upholstered with a removable nautical yacht fabric canvas cover for easy cleaning, and 12 additional throw pillows (each pillow measures 20" x 20").